An interesting experience today. There is a seminary of Saint Thomas Christians (Syrian Malabar Nasrani) here in Rishikesh. The name of their ashram is Samanvaya Vidya Dham which indicates a bit about their approach. You can get an idea of the purpose of this institution by scrolling down to page 74 of this document. 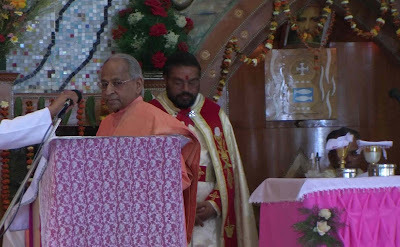 They invited Swami Veda and his disciples to their church near Laxman Jhula to participate in a mass which initiated 17 young men into the minor orders of the priesthood, namely lectorate and subdeaconate. These students have spent the last year in Rishikesh and they will be working in North India. Though they are all Keralans, they speak fluent English and Hindi. In fact, they all look extremely sattvik and they are trained to a very high educational level. If Hindu sannyasis were put through the same kind of training requirements that this sect puts its priests through, it would be of greatest benefit to everyone, both within Hinduism and without. The priest who invited us, Davis Varayilan CMI, started his introductory discourse by saying that the police had visited the ashram a few days before asking about their conversion activities. There is a lot of sensitivity about that around here obviously, and they are feeling the heat. They had to explain that St.Thomas came to India in 52 AD, so their church is nothing new in this country. Most, of course, think of the Christian church in relationship to the aggressive missionary tactics used by American Protestant churches. Fr. Varayilan said that the position of the Thomian Catholics is "Indian in culture, Christian in faith, and Oriental in its rites." But as I heard in the JNU conference last week, with the coming of the Catholics into India, especially in the 18th century, the Keralan Christians became more and more closely aligned with Roman Catholicism and the mass we saw today was a classic post-Vatican II celebration, only transposed into Hindi, with the hymns, etc., sung in North Indian bhajan style. It was a bit interesting to hear the Sanctus or Agnus Dei presented in that way, but on the whole, a very nice adaptation. In fact, Fr. 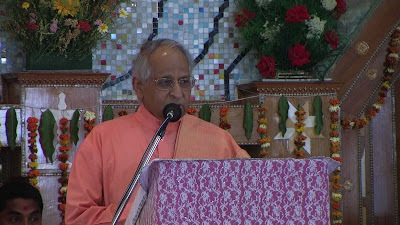 Varayilan said that the purpose of having the seminary in Rishikesh was to compensate a bit for the overly European influence and to reconnect with the Indian roots of the religion. It was meant to familiarize the seminarians with Hindu religious practices, yoga and meditation, and it was precisely for this reason that the group was invited to SRSG for a week last year, going through a meditation retreat and getting classes from Swami Veda Bharati. On the ceiling of the church, they had six symbols of the major Indian religions: Hinduism, Jainism, Buddhism, Islam, Christianity and Zoroastrianism (if I got them right). This is a clear indication of the direction that an "Indian" Christianity would take, a rather more salutary approach. Interestingly, they specifically, as Keralans, spoke of themselves as descendants of Shankaracharya. 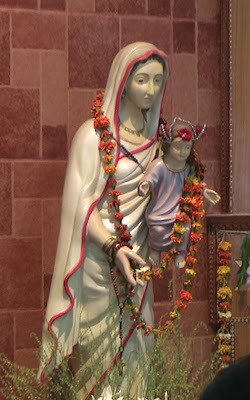 Listening to the mass, which concluded with a rousing Jai Jagadish Hare arati, I was wondering about the relation of form to content. At any rate, it is very welcome to see a Christian group so warmly embracing Hindu-style pluralism. Indeed, when speaking of the experience at SRSG, one of the priests recited the old adage, "Religion divides and spiritualism unites." I hesitated a moment before taking communion (parama-prasada, but showing solidarity with the cause of interfaith brotherhood, I did so. I usually felt the same kind of hesitation when at church during my son's career as a choirist, perhaps as a result of the childhood training that there was no communion without confession. You have to be in a state of grace. But left to my own subjectivity, I would never be in a state of grace, so I just went ahead. Strange feeling. I guess that all that interfaith conferencing in Patiala had its effect. "The priest who invited us, Davis Varayilan CMI, started his introductory discourse by saying that the police had visited the ashram a few days before asking about their conversion activities. There is a lot of sensitivity about that around here obviously, and they are feeling the heat. " I am researcher who is having some kind of interest in this issue. Can I have your email? Singing christian songs in Hindu bhajan style is a way of mis-leading village people and then converting them.